Sky High Gardens considers themselves to be a boutique grower and has a team of about twelve employees. They’re located in Seattle about one mile south of Century Link Field, so I counted myself blessed when I was able to catch their CEO and COO, Phil and Unel, during a vendor day visit at Xander’s Green Goods in Tacoma. Talking to them briefly, I learned that they use a modified soil-less medium for their indoor hydroponic grow operation, that they flush their plants for ten days, and cure their plants for a minimum of forty-five, often longer if the ladies require it. And these guys are super-proud of their hand-trimmed, hand-packed, full-flower pre-rolled joints. Full disclosure — I recently picked up one of their pre-rolls. I smoked up some Alien Asshat and got inspired to write In The Wind, so that being said, I can attest to the quality of their pre-rolls as being some of the better ones available on the market. It’s been my experience that many companies use low-grade trim to machine-pack their pre-rolls. And, frankly, when you do that, the lack of quality shows. Sky High Gardens uses only full flower and the quality is directly reflected in the final product. For the purpose of all my previous reviews, I had, up to this point, only toked on full flower in a clean Roor glass pipe. But since my last review, the Roor spoon has crossed over the Rainbow Bridge and is patiently awaiting my return to Asgard. That means, back here on Midgard, I’ll be smoking on a full flower joint as rolled by myself, using Raw classic paper. Even though I’m a super-fan of Zig-Zag, Raw just seems to leave behind the least amount of impurities. And besides, there’s just something about hemp-on-hemp. If I’m not careful, I’ll be using hemp wick before I know it. Always remember to keep it simple, stoner. I asked if there was something about their company or operations they really wanted my readers to know. They both agreed that it was important to state that they ‘package to order.’ That is, they grow the cannabis they intend to grow. Only after the entire process is said and done — veg, bloom, flush, trim, and cure — it’s only then that they contact shops to take in orders. They believe this provides the best boutique quality experience to the cannabis consumer. So what strain do they feel represents them the best, currently? What are they most proud of? “Pineapple Chunk,” Phil answered, without missing a beat. They also suggested Blue Dream, which is, “More of an old school, elevated experience, marked with a head raciness followed by a body chill.” And they wanted me to be sure to let you know that they are working hard to bring you Animal Crackers. Typically a cross between Animal Cookies and The White, Animal Crackers should have all the Girl Scout Cookies fans clamoring when it hits the scene. And I agree — I’m totally looking forward to burning some down, especially since their Blue Dream was so on point. But today we’re taking flight with their Pineapple Chunk, which is a blend between Pineapple, Cheese, and Skunk #1. Unel was absolutely correct in stating that she packs a lot of skunk in her genes. Back in the eighties, Cheese had been originally bred out of a bag of Skunk #1 produced by Sensi Seeds. Somewhere in the Chiltern Hills of South East England, one single female flower exhibited such unique traits, like that patented cheesy aroma, that everyone wanted her. So she found herself propagated throughout cannabis communities in Britain, most notably the Exodus community. At the end of the day, she’s a skunk variety that brings together Afghani indica genetics with sativa genes from Mexican and Columbian landraces. Yeah, this means that Pineapple Chunk has a nice double dose of skunky goodness bred into her. But let us not forget about the mighty Pineapple. Pineapple comes to us originally as an F2 variety of Ed Rosenthal’s Super Bud, a legendary strain named after a legendary grower that would be worthy of an article all its own. 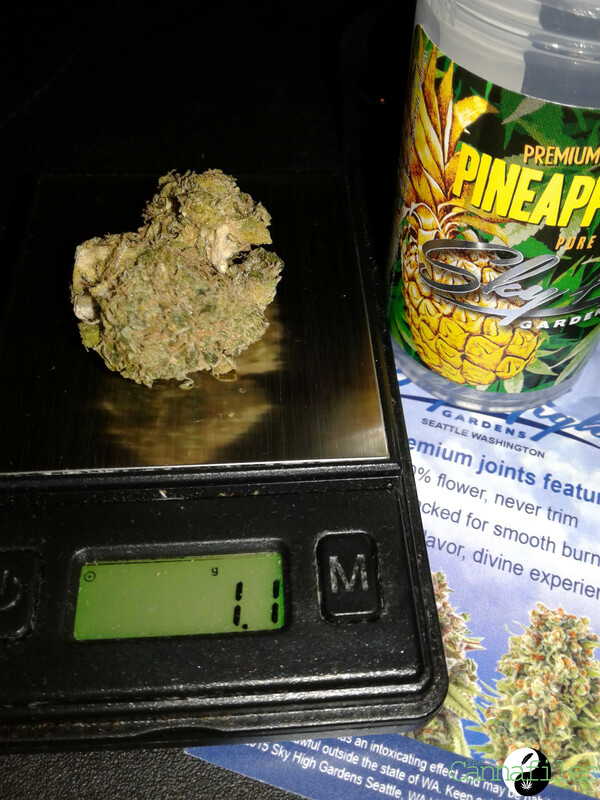 But for our purposes here, just know that Pineapple packs genetics from landraces brought together over a twelve-year period. Ed Rosenthal’s opus was born out of bringing together varieties of Hindu Kush with other landrace Afghani indicas. He further blended and re-blended in Mexican and Thai landrace sativas along with some sort of 50/50 hybrid that came out of Africa. Twelve years and numerous generations later and the man produced perfection. Pineapple’s genetics alone make my mind crave flight, but add in those old school skunk genes and you can forget the frequent flyer miles. Let’s get this red eye rolling down the tarmac already. Sitting inside a plastic container are my two nugs of Pineapple Chunk grown by Sky High Gardens. I’ve checked my baggage, cleared the gate, and boarded the plane. It appears that for their grams, Sky High Gardens chooses to package in plastic containers, whilst their eighths are packaged in glass. Both products feature nice artwork on the label — very colorful. Sitting with seatbelt attached, I make certain that my tray is in its full and upright position, then pop open the plastic container. She opens with a sweet, mango-like scent that immediately sets the cabin on dank alert. Then a little bit of pine creeps in after breaking the buds apart and we’re ready for liftoff. These buds are tightly trimmed and feel properly hydrated, though I personally prefer my cannabis a tad plumper. I inquired about their preferred relative humidity, but Phil was quick to inform me that he felt that was proprietary. Personally, I like my weed around 62RH. Regardless if they’re at 58RH or 60RH, their product is dense yet soft to the touch, and the leaf is predominantly darker shades of green. Orange and red pistils peek out all over the place; this bud is covered with frost. Under the scope these trichomes appear to be mostly clear in color with thin stalks, many of which are missing their heads. Either they were not fully formed or had broken off during the packaging and shipping process. Grinding Pineapple Chunk reveals a heavy, sweet, skunk aroma that overtakes the softer fruit tones. Rolling her up is very easy. I did not expect her to be as soft and malleable as she was, but she rolled up very easily. She sparks up nice, burns well, and we have liftoff. Pineapple Chunk definitely has a sweeter taste with a slight hint of skunk. Complex is right. She drifts back and forth between sweet skunk and sweet fruit. She’s mostly sweet skunk on the flavor, but I definitely get hints of mango floating through undercurrents of earthy pine that make me recline my seat all the back. Sky High Gardens does themselves proud here. She hits smooth and burns clean and continues to do so well past the halfway mark of this spliff. There’s a nice heady start with a slow ear warmth. It burns consistently with the taste only turning slightly bitter toward the end of the joint, but that’s expected because of all that resiny goodness collected at the bottom of the spliff. Roaches — they’re not for everyone. My eyes feel thick, so thick. There’s a lovely stone rolling in. I can barely see, but the ash color looks to be light gray and powdery soft. Truly, her skunk genetics are on full display as far as the effects are concerned. I won’t be feeling any turbulence on this flight. She’s definitely heady to start but flows wonderfully through the body, softly melting every muscle into the cabin of the plane. A truly beautiful, sensory drift. Just wake me when we land. Sky High Gardens pioneers premium marijuana in Washington’s recreational market. A cannabis industry we are a leader, we set the standard for quality.